I recently got myself what must be one of the greatest little bags around and at a price that makes it almost a no brainer to own, the Lowepro Exchange Messenger. As photographers with expensive gear – particularly those of us who do it as a hobby – we are paraniod about keeping our gear safe and secure. Who of you out there did not feel the thickness of the padding on each bag you looked at and can honestly say that the level of padding was not a matter of consideration in your final choice of a bag? I am not saying that you should not protect your gear, but I am also going to venture out there and say that in many instances, the gear we use is more hardy than we think. Sure its not going to hold out well from a drop off a table, something is going to get hurt, but from a camera bag perspective when you out shooting, you can get away with less. 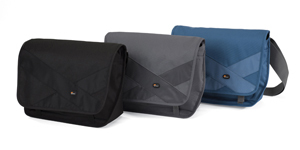 The Lowepro Exchange Messenger is light and has minimal padding. It can be packed flat into your luggage when on a long trip and be taken out for carrying just the gear you need for that day. In essence it is a bicycle courier styled bag with two light padded dividers that make three compartments. It can be used as your carry all gear round for the day bag or – for example – as wedding shooters lens bag where the camera is usually around your neck and you just want something to make changing lenses easier which is not bulky. Yes it may not be as fashionable for the ladies as the ShootSac but for a few hundred Rand (I have seen them priced well below the R500.00 mark) it is as I said in the beginning, a bit of a no brainer. Lowepro is distributed in South Africa by Singer Photographic. For a list of international distributors check out Lowepro’s website here.